Heat oven to 350°F (325°F for a dark or nonstick pan). Grease bottom only of a 13-by-9-inch pan and set aside. In a large bowl, beat together cake mix, water, vegetable oil, eggs and poppy seeds on low speed 30 seconds; increase speed to medium and beat 2 minutes more. Pour batter into prepared pan. Bake cake about 30 minutes, or until a toothpick inserted in the center comes out clean. 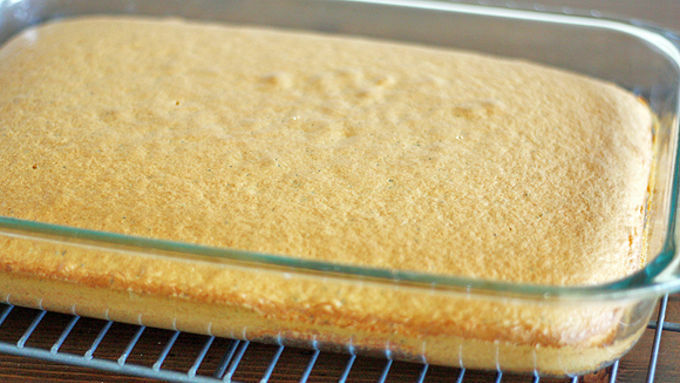 Let cake cool 15 minutes in pan; carefully remove from pan and cool completely on a cooling rack. 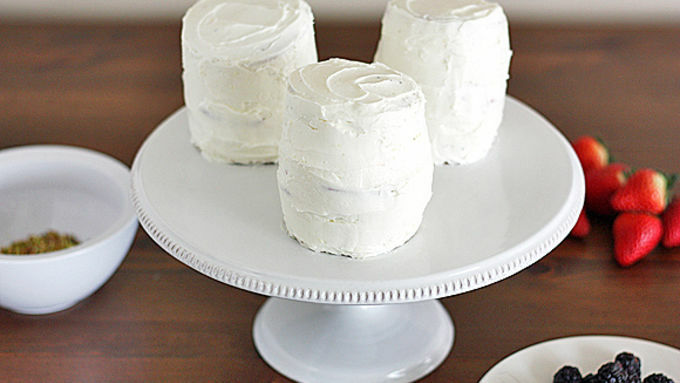 Cut cake into circles using a 3-inch wide cookie cutter (you should get between 7-8 circles). Frost a VERY thin layer of frosting on the sides and top of each cake. 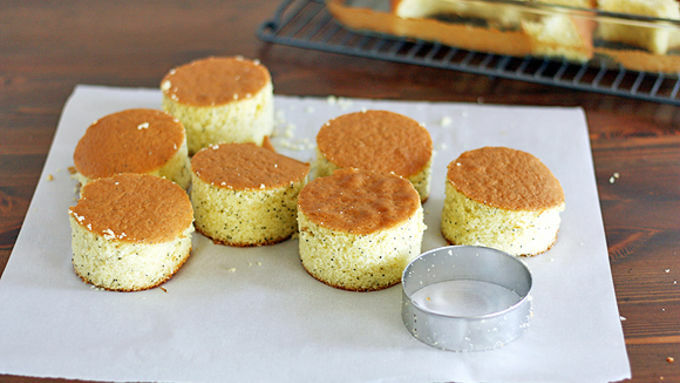 Place cakes on a parchment paper-lined baking sheet and set in freezer for 1 hour to harden. 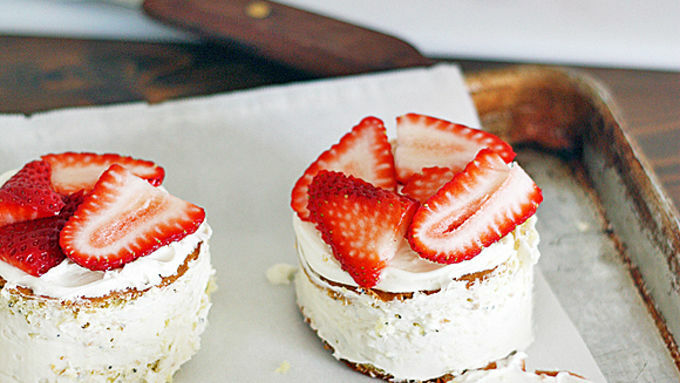 Remove cakes from freezer; top half of the cakes with frosting and a layer of sliced strawberries. 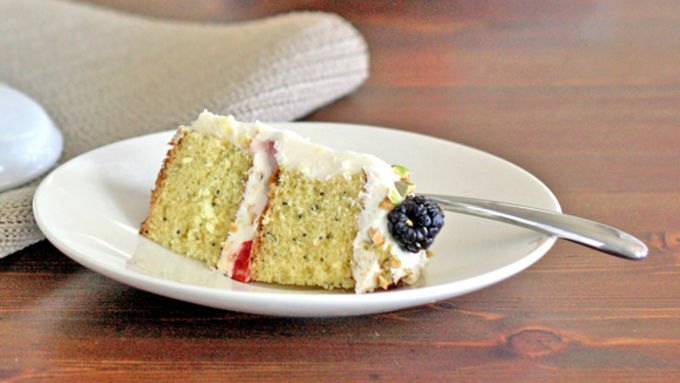 Top strawberry layer with a dollop of frosting and then top with second cake. Return to freezer for another 30-45 minutes or until cakes are hardened and set. Frost frozen cakes with remaining frosting. Garnish with fresh strawberries, blackberries and chopped pistachios. Boys and gals! Spring has sprung and I couldn’t be happier. In fact, I’m gonna celebrate -- with cake. But not just any cake, oh no. I’m celebrating with these cheery individual Mini Strawberry-Blackberry Poppy Seed Cakes. Aren’t they just the perfect way to ring in spring? Well, it’s cake, so -- there’s no question. Say YUM to springtime! 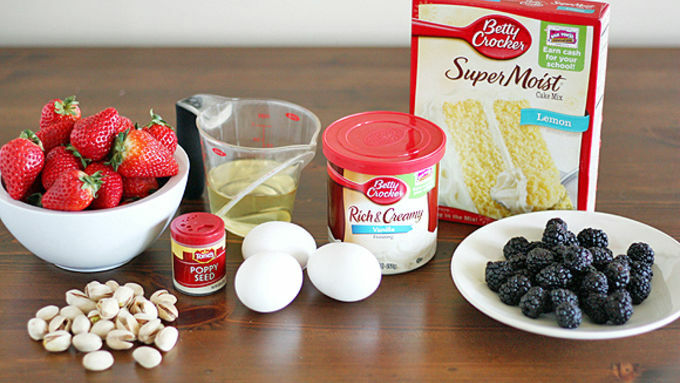 We make this recipe even easier and tastier with Betty Crocker lemon cake mix. Have you tried it? It’s like taking a bite of heaven, no joke. You’ll see. 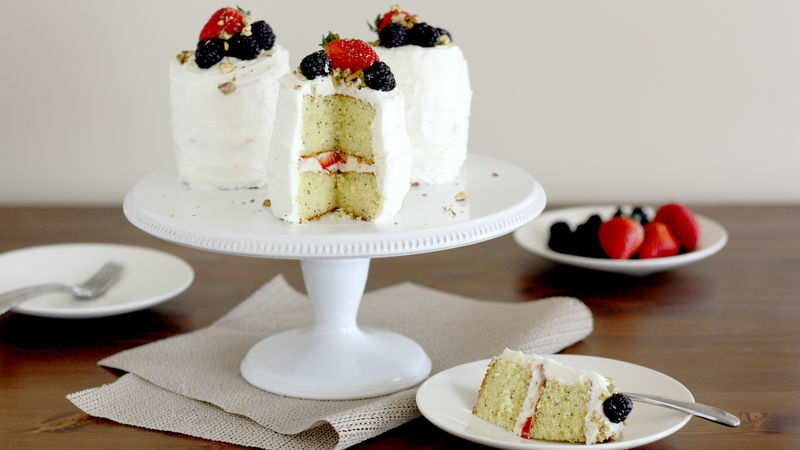 After you decorate the tops of each cake with fresh strawberries, blackberries and chopped pistachios, you’ll see they are just adorable. Just beautimous. Just marveloiuhalsgsdfomnomnom -- sorry, I couldn’t wait any longer. I just had. to. take. a. bite. I meaaaaan.... There’s no question. Just plain deliciousness.